Jammu and Kashmir local body polls: Polling in the second phase of the local body elections in Jammu and Kashmir began at 6 am amid tight security. A total of 384 wards covering 13 districts of which 7 are in the Valley, are going to the polls. Jammu and Kashmir local body polls phase 2 LIVE updates: Polling in the second phase of the local body elections in Jammu and Kashmir is underway tight security. Officials involved in the conduct of municipal elections said that while locals have come out in a good number to exercise their franchise in Jammu, only 1.8% turnout was recorded in the Valley till 11 am. A total of 384 wards covering 13 districts of which 7 are in the Valley, are going to the polls. The 13 districts are Kathua, Kishtwar, Reasi, Ramban, Udhampur, Doda, Srinagar, Baramulla, Kupwara, Bandipora, Kulgam, Anantnag and Badgam. A PTI report said that 1,095 candidates are trying their luck in this phase, adding that 65 have won the polls uncontested which includes 61 from the Kashmir region. Also, no polling will be held in 70 wards in the Valley as no nomination was received by the state Election Commission from these seats. Meanwhile, officials said elaborate security arrangements are in the place in all districts for smooth conduct of the polling process. Also, the poll authorities have increased the voting time by 3 hours to increase participation of the public. The voting started at 6 am and will end at 4 pm. Earlier, the state Election Commission had decided that the polling in all the four-phase will be held for 7 hours (7 am to 2 pm). Jammu division turnout in 6 hours- Kathua 57.4%, Udhampur 50.8, Reasi 60.8, Doda 57.8 and Kishtwar 55.9%, Ramban 62.9%. The state is holding municipal polls after 13 years. Bandipora topped the voter turnout at 22.2% in the Valley till 12 noon. In Srinagar, Baramulla, Kupwara and Anantnag districts, voter participation was a feeble 1.4, 3.7, 3.3 and 0.8 %, respectively. In Ramban district, a BJP candidate died of heart attack when he reached a polling station to cast his vote. The deceased man has been identified as Azad Singh Raju (62), a former employee of the Irrigation and Flood Control Department. He was among 24 candidates in the fray for the 7 municipal bodies of Ramban district. Around 2% of the electorate voted till 11 am in 49 wards of urban local bodies in Kashmir. "Only 1.8 per cent of the 2.20 lakh electorate have cast their votes in the first five hours," an official told PTI. Voting began at 6 am and will end at 4 pm. The municipal polls in the border state are being held for the first time since 2005. According to the schedule, the elections will be held in four phases. The first phase polling was held peacefully on October 8. Today, elections are being held across 384 wards of 13 districts. Polling in the third and fourth phases will be held on October 13 and 16. Counting of votes is slated to take place on October 20. Peaceful voting is underway in the 20 wards of Srinagar Municipal Corporation (SMC) in Srinagar. Elaborate security arrangements have been put in place across all the wards for the trouble free conduct of election. According to the state Election Commission, the overall voting percentage in the first phase of municipal election was 56.7%. Rajouri district in Jammu region had recorded the highest turnout at 81%. The lowest turnout of 3.3% was recorded in Bandipora district of Kashmir region. Leh recorded 55.2% voting, Kargil 78.1%, Jammu 63.8%, Rajouri 81% and Poonch 73.1%. Peaceful voting is underway in the second phase of local body elections in Jammu and Kashmir. According to a report in IANS, voters are queuing up outside poll booths in Jammu but in seven districts of the Kashmir, the turnout is very poor. The two prominent political parties in Jammu and Kashmir -- National Conference of Farooq Abdullah and PDP of Mehbooba Mufti, are not participating in the polls. The two parties have alleged that the situation in the state is not conducive for holding elections and the election a ‘mockery’ of the democratic process. They have also demanded from the BJP-led Central government to clear its stand on Article 35A of the Constitution. The NC and PDP have even threatened to boycott the general elections next year is the government makes any attempt to repeal the Article. The state administration has declared holiday on the day of poll in the areas where polls are being held to enable voters cast their vote. According to PTI, in the second phase, 1,029 candidates (881 in Jammu division and 148 in Kashmir division) are in the fray. It said that 274 polling stations have been designated for voting in Jammu division and 270 in Kashmir division. Meanwhile, massive security arrangements have been put in place to ensure smooth conduct of the polls. Meanwhile, in a bid to increase the participation of people in the Kashmir region, the poll authorities have announced that voting process will continue till 4 pm. Earlier, the state Election Commission had announced that voting process in all the four phased will be held between 7am and at 2 pm. But today, the voting process began at 6am, thus giving the votes an advantage of 3 hours. Meanwhile, separatists have one again announced shutdown in the Valley and urged people not to take part in the democratic process. However, people in large number have come out to exercise their franchise. According to news agency ANI, mobile internet services have been suspended in the entire south Kashmir to check spread of rumours and fake messages. Elections are being held across 384 wards of 13 districts of which seven are in the Kashmir region. Also, the mobile internet services have been reduced to 2G in rest of Kashmir. According to an election official, no nominations were received in 70 wards in the Valley, therefore in these wards, no polling is taking place. In Kulgam district’s Frisal municipal committee, there are 13 wards but only one candidate filed election papers. Likewise, out of 13 wards in Beerwah municipal committee of Badgam district, only person filed the necessary documents to enter the fray. The Beerwah assembly seat is represented by former CM and National Conference leader Omar Abdullah in the state Assembly. 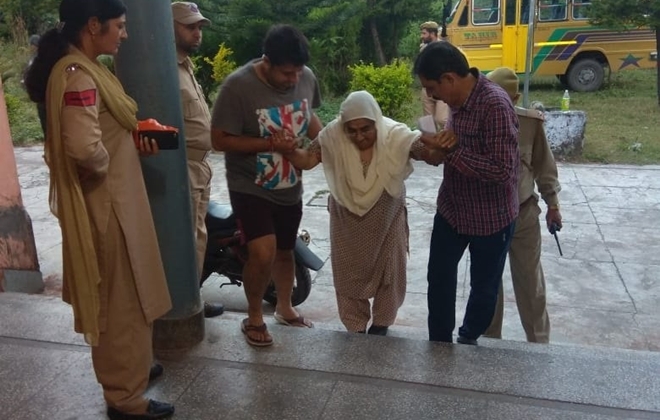 A 84-year-old woman arrives at a polling station in Reasi to exercise her franchise in the second phase of urban local bodies elections. The polling across 384 wards of 13 districts began at 6 am amid tight security. The voting time has been extended by 3 hours in this phase to increase participation of the public. Of the 13 districts, 7 are in the Kashmir region. To ensure a peaceful and conducive environment for the smooth conduct of elections, the Centre has deployed 400 additional companies of paramilitary forces to the border state. Interestingly, the main contest in the state is between the BJP and Congress. The two prominent political parties of the state - National Conference of Farooq Abdullah and Peoples Democratic Party of Mehbooba Mufti are not participating in the elections. They have argued that the prevailing situation in the state is not conducive for holding elections and are also demanding from the Centre to clear its stand on Article 35A of the Constitution that grants special autonomous status to the state. The remaining third and fourth phases of the Jammu and Kashmir municipal elections will be held on October 13 and 16. Results will be declared on October 20. The last municipal elections in Jammu and Kashmir were held in 2005.